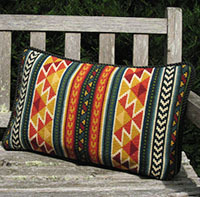 This pattern was inspired by geometric motifs from saddle bags of the many Nomadic tribes that travelled between Mongolia, Persia and Turkey. areas adapted designs from other regions to suit their own techniques. In our cross-point technique, this pattern is a lot of fun to stitch! Please visit the website to see more colors and all sizes. Remember that PayPal will charge the full price plus shipping and I issue the credit for the 20% discount the same day I receive the order from the website. Or you can call your order in by telephone. This entry was posted in Autumn/Early Winter, Blue & White colors for summer stitching, cross-point kits, Design of the Month, Historic Kilim patterns, Historic Textile Patterns, Meadow & Field colors for summer stitching, Part I - Cheerful Autumn Colors for stitching and tagged About cross-point, blue & white pillows, bright cross-point colors, classic color combinations, color schemes for stitching, credit card processing, cross stitch kits, crosspoint kits, Interior Design, Kilim stitching patterns, needlepoint kits, PayPal, Sieglinde Anderson Designs, White and Blue. Bookmark the permalink.